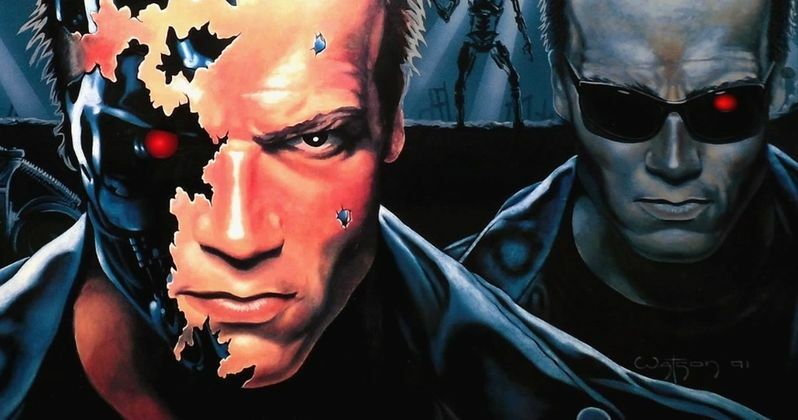 Tim Miller's Terminator 6 has been delayed until November of 2019, according to an announcement from Paramount. Many began to speculate that the delay was due to Arnold Schwarzenegger's recent emergency open-heart surgery, but the studio insists that isn't the case. Arnold Schwarzenegger underwent the heart surgery last week and reportedly said "I'm back," when he woke up from the intense surgery that took hours. The actor has been talking up Terminator 6 for the last handful of months. Paramount states that the move to delay Terminator 6 was actually decided months ago. However, the studio did not give a reason for the delay. Instead of July, the movie will now come out on November 22nd, 2019. The delay is only a handful of months and is more than likely to punch up the script before filming begins. Filming was expected to begin this summer, but it isn't clear when production will start now, though it will probably mirror the release date and get pushed back a few months. Deadpool director Tim Miller and producer James Cameron are working together on Terminator 6 while Cameron simultaneously works on Avatar 2. The movie will see Linda Hamilton and Arnold Schwarzenegger on screen together for the first time since 1991's Terminator 2: Judgment Day. Linda Hamilton is reprising her iconic role as Sarah Connor with Schwarzenegger obviously back as the T-800. Hopes are high on Terminator 6 since Cameron and Hamilton are both returning to the franchise. Additionally, fans are also excited to see what Miller will bring to the table after the disastrous Terminator Genisys. As for the plot of Terminator 6, not much is clear at this time. But, James Cameron has said that the movie will be a direct sequel to Terminator 2: Judgement Day, which means that it will erase any of the movies that came before it. Cameron says that they're basically ignoring any if the other movies or TV shows and treating it as a multiverse or an alternate timeline. The director even joked that they're pretending that the other films were a "bad dream," which is pretty much what fans of the franchise have tried to do for years. Terminator 6 will see the introduction of new characters and will be similar the latest Star Wars trilogy in that it will have Linda Hamilton and Arnold Schwarzenegger there to pass the baton, like The Force Awakens and The Last Jedi. While details are scarce, the hype remains high for Terminator 6 and the future of the franchise after the movie comes out. And while the project has been delayed, it's only a few months, which will give Schwarzenegger some extra resting time while he recovers from his open-heart surgery. As previously mentioned, the new release date is November 22nd, just in time for Thanksgiving. You can read more about the delay of Terminator 6 over at Variety.